Pro paintball looks like a lot of fun, right? Well, now you can play like the pros too. 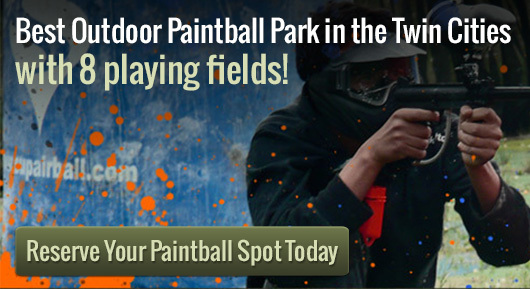 At Action Packed Paintball, you’ll play the day away. As the leading paintball facility in the Minneapolis and Twin Cities Area, the outdoor paintball park is sure to please, with 8 different playing fields, paved parking, indoor restrooms, and a place for spectators to watch and still be part of all the fun. By coming here, pro paintball isn’t that far off from what you’re doing! Want a private paintball game? Just call and reserve one, any day of the week. Or, if you’re a lone ranger, come by and meet new people as you play like a pro. The staff are friendly, experienced, and knowledgeable. First time players need not worry; someone will always have your back! By the time you leave, you’ll be a pro paintball player. There are CO2 and compressed air refills, as well as (when you work up an appetite) vending machines and an outdoor grilling area to fulfill all your refueling needs. In addition to regular paintball game play, there are special packages that are sure to please your wallet. Rental packages and season passes are always available, as well as walk-on play. If you’re looking to have a cool birthday party that everyone will remember, come have it here! At Action Packed Paintball, nothing could be better. So give us a call or shoot us an email, or even drop by! We’ll be glad to help you out.